PVMBG reported that an explosion from Gamalama at 1152 on 4 October was likely phreatic; it generated an ash plume that rose about 250 m above the summit and drifted NW. Eight volcanic earthquakes were recorded about an hour before the event. Based on satellite data and information from PVMBG, the Darwin VAAC reported that during 5-6 October ash plumes rose to 2.1 km (7,000 ft) a.s.l. and drifted W and NW. The Alert Level remained at 2 (on a scale of 1-4); visitors and residents were warned not to approach the crater within a 1.5-km radius. Based on analyses of satellite imagery and model data, and information from PVMBG, the Darwin VAAC reported that during 3-4 August ash plumes from Gamalama rose to an altitude of 2.7 km (9,000 ft) a.s.l. and drifted S, SE, E, and NE. On 5 August PVMBG noted that seismicity continued to be elevated although inclement weather prevented visual observations. PVMBG reported that at 0628 on 3 August a weak explosion at Gamalama generated an ash plume that rose 500-600 m above the crater and drifted SE and S. Ash emissions declined at 0655. Ashfall was reported in areas on the SSE flank including Ake Huda. The report also noted a brief airport closing. The Alert Level remained at 2 (on a scale of 1-4); visitors and residents were warned not to approach the crater within a 1.5-km radius. PVMBG reported that during 1 August-4 November seismicity at Gamalama fluctuated, and was dominated by hybrid earthquakes and signals indicating emissions. Three periods of increased seismicity were recorded during 3-5 and 11-19 August, and 8-22 October, though seismicity declined overall. A sudden, small eruption from a fissure on the NW flank occurred at 1953 on 8 September with no precursory seismicity, and produced a plume that rose 1 km. Gray plumes rose from 300-600 m the vent during 9-24 September. White plumes rose from Main Crater and fissures on the E and NW flanks as high as 200 m during 1 October-3 November. The Alert Level remained at 2 (on a scale of 1-4); visitors and residents were warned not to approach the crater within a 1.5-km radius. Based on satellite images, information from PVMBG, and wind data, the Darwin VAAC reported that on 8 September an ash plume from Gamalama rose to an altitude of 3 km (10,000 ft) a.s.l. and drifted over 25 km NE. On 4 August, BNPB reported that Gamalama continued to erupt, although with low intensity. Tremor was continuous. The Alert Level remained at 2 (on a scale of 1-4); visitors and residents were warned not to approach the crater within a radius of 1.5 km. The total number of evacuees in shelters was 1,791. Based on local observations, a SIGMET and wind data, and satellite images, the Darwin VAAC reported that an ash plume drifted over 20 km NW on 4 August. BNPB reported that a phreatic explosion at Gamalama on 16 July generated a gray-and-white plume that rose as high as 1.5 km above the crater and drifted N. The Alert Level remained at 2 (on a scale of 1-4); visitors and residents were warned not to approach the crater within a radius of 1.5 km. The Sultan Babullah International airport in Ternate was closed on 18 July. Several explosions during 18-19 July produced white-and-gray plumes that rose 300-800 m and drifted NW. A preliminary count of refugees showed there were 1,505 people (450 families) displaced by the eruption. Ash deposits were 1.5-6 mm thick in northwestern villages. Based on pilot reports, ground-based observations, wind data, PVMBG reports, and satellite images, the Darwin VAAC reported that during 16-20 July ash plumes rose to altitudes of 2.1-5.5 km (7,000-18,000 ft) a.s.l. and drifted 20-130 km NE, NW, W, and SW.
PVMBG reported that during March-22 April diffuse white plumes rose as high as 50 m above Gamalama; on 7 April the plumes became dense and rose 100 m. Seismicity fluctuated but remained generally low. The Alert Level remained at 2 (on a scale of 1-4); visitors and residents were warned not to approach the crater within a radius of 1.5 km. Based on satellite observations, ground reports, and wind data, the Darwin VAAC reported that during 24-25 December ash plumes from Gamalama rose to an altitude of 2.1 km (7,000 ft) a.s.l. and drifted almost 30 km SW. According to a news article, an eruption at Gamalama on 18 December generated an ash plume that rose 2 km. Nine hikers fell as they ran to safety; four were injured and one was missing. Slow-moving lava at the summit was visible, and ashfall occurred in local villages. The Sultan Baabulah airport, 6 km NE, was closed along with schools and businesses. 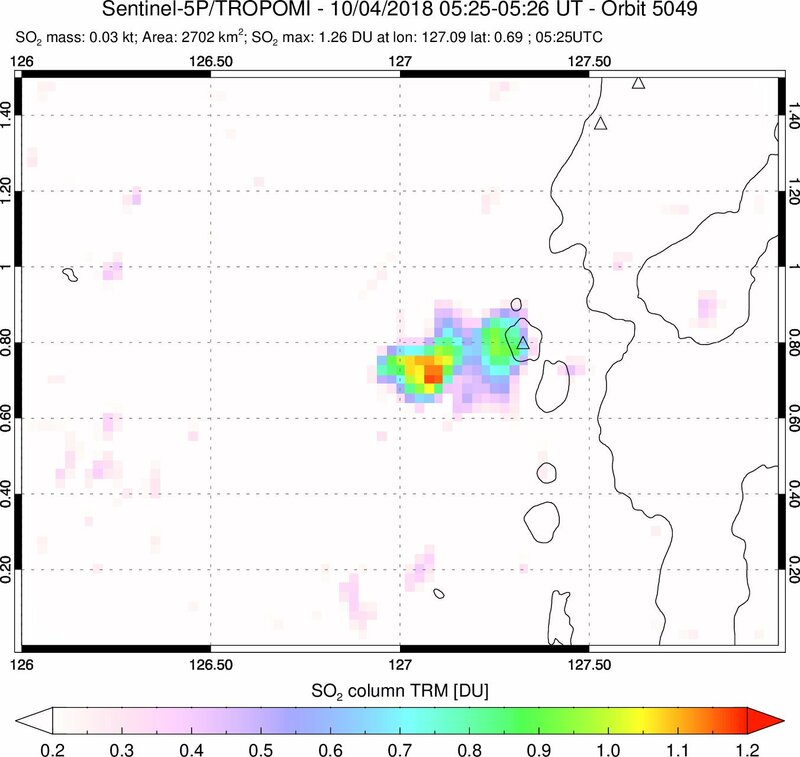 CVGHM reported that during 1-14 September cloudy weather and fog at Gamalama mostly prevented observations from the post in Marikurubu and from S Ternate (S, SE, and E part of island); white plumes were sometimes observed rising 10 m above the crater. A phreatic eruption on 15 September at 2027 produced ashfall in Ternate. An eruption at 1415 the next day was accompanied by rumbling sounds. A plume rose 1 km and drifted SE and S, producing ashfall at the Gamalama observation post five minutes later. Neither eruption was observed due to fog. The Alert Level was raised to 3 (on a scale of 1-4) on 16 September. Visitors and residents were warned not to approach the crater within a radius of 2.5 km. Based on a SIGMET and information from the Ujung Pandang City MWO, the Darwin VAAC reported that on 14 December an ash plume from Gamalama rose to an altitude of 3 km (10,000 ft) a.s.l. and drifted 140 km S.
Based on information from CVGHM, the Darwin VAAC reported that during 7-10 December ash plumes from Gamalama rose to altitudes of 2.1-6.1 km (7,000-20,000 ft) a.s.l. and drifted E and SE. The Alert Level for Gamalama remains at 3 (on a scale from 1-4). CVGHM raised the Alert Level for Gamalama from 2 to 3 (on a scale of 1-4) on 4 December based on seismicity and visual observations during 1-4 December. On 1 and 4 December white plumes rose to an altitude of 0.15 km (492 ft) a.s.l. and drifted W. Clouds obscured views on the other days. Based on information from CVGHM, the Darwin VAAC reported that during 5-6 December ash plumes from Gamalama rose to altitudes of 2.4-3.0 km (8,000-10,000 ft) a.s.l. and drifted SE. CVGHM raised the Alert Level for Gamalama to 2 (on a scale of 1-4) on 11 May based on seismicity and visual observations during 10-11 May. On 10 May, white to gray plumes rose to an altitude of 1.8 km (5,900 ft) a.s.l. and drifted N. Residents and tourists were not permitted within 2 km of the summit. CVGHM lowered the Alert Level for Gamalama to 1 (on a scale of 1-4) on 9 October based on visual observations of plume altitudes and a decline in seismicity. CVGHM raised the Alert Level of Gamalama on 24 August from 1 to 2 (on a scale of 1-4) due to an increase in activity. Prior to 10 August, diffuse white plumes rose to an altitude of 1.8 km (5,900 ft) a.s.l. then increased in altitude to 2 km (6,600 ft) a.s.l. during 10-23 August. On 23 August, white and gray plumes rose to an altitude of 2.1 km (6,900 ft) a.s.l. Concurrent with the increased Alert Level, government officials banned access within a 2-km radius of the active crater. Volcanic activity decreased at Gamalama during 6-12 October, leading DVGHM to reduce the Alert Level from 2 to 1 (on a scale of 1-4) on 13 October. During the report period, gas emissions rose to ~50 m above the summit and the number of daily earthquakes decreased to normal levels. VSI raised the Alert Level at Gamalama to 3 (on a scale of 1-4) after an explosion on 31 July around 1430 produced an ash column that rose 0.5-1 km above the volcano and drifted E. Another explosion occurred at 1439 that rose to 1-1.5 km above the volcano, and deposited ash in the town of Ternate ~30 km N of the volcano. The next large explosion occurred at 1625 and ejected incandescent material, produced an ash column that reached 1-2 km above the summit and drifted E, and was accompanied by a pyroclastic flow that traveled ~1 km into the Togorara Valley. VSI raised the Alert Level to 4, the highest level, and some residents near the volcano were evacuated. After an explosion at 1704 produced an ash cloud to 1-1.5 km above the volcano, low-level ash and gas emissions occurred at Gamalama through 1 August. An incandescent tephra eruption from the central crater began with an explosion on 4 September at 1430, followed by a second ~ 2 hours later, and others at 0030, 0330, and 1120 the next day. Incandescent material fell 500-750 m from the crater, starting brush and forest fires. Ash fell on the entire island, accumulating to a depth of 10 cm by the second day of the eruption at Ternate City, 7-8 km E of the crater. Ash thicknesses reached 15 cm on some parts of the island, according to AFP. Two earthquakes were felt by persons remaining on the island on 6 September as the eruption continued. By 7 September, activity had declined. Ash clouds rose ~ 1 km and were blown N by the prevailing wind, keeping ash away from the S half of the island, including Ternate City. About 40,000 of the approximately 60,000 residents fled Ternate Island for Tidore Island, 5 km to the S, during the first two days of the eruption. No casualties have occurred according to the VSI, AFP, and Reuters, although some of the broadcast press apparently incorrectly reported casualties. A hazard map previously prepared by VSI delineates a danger zone of 33 km2 (population 2,500) in the summit area and an alert zone of 30 km2 on the N, NW, and NE flanks (population 2,500). The S and E parts of the island are considered to be safe by VSI. Information Contacts: A. Sudradjat, VSI; AFP; Reuters. The eruption continued vigorously into late September. Seven explosions were recorded during the first week of activity, 17 the second week, and 15 the third week. Eruption clouds ranged from about 500 m to 1,800 m in height. Bombs fell as much as 1 km away, most heavily to the N and NE. By early October, eruptions had ended, but seismicity continued, with episodes of volcanic tremor lasting up to 4.5 hours. Most evacuees had returned home, but some small villages in the NE sector red zone remained evacuated. Kompas newspaper reported that a new crater had formed ENE of the summit. Both the summit crater (two vents) and the new crater have ejected incandescent tephra. AFP reported that an eruption began 9 August. Residents of villages closest to the volcano were awakened at 0445 by the activity. A thick black eruption column containing incandescent material rose 1.5 km and "red-hot lava" moved down the N flank, destroying scores of homes and plantations. Ash fell W of the volcano, closing an airport. Explosions on 10 August at about 1000 and 1200 produced 1.5-km ash columns. A wind shift threatened to cause ashfalls E of Gamalama. Earthquakes centered on the volcano accompanied the eruption. More than 5,000 persons living near the volcano evacuated to the town of Ternate, capital of North Moluccas regency. No casualties were reported. Despite bad weather, vessels were standing by in case Ternate required evacuation. Gamalama erupted on 12 February at 1830, spreading ash over a wide area of Ternate Island. No new lava flow accompanied the activity. VSI issued an aircraft advisory on 13 February, warning of potential hazards from the activity. The press reported that police and soldiers had helped evacuate ~ 1,500 residents of villages near Gamalama, added to ~ 2,000 people from the same area who had previously been evacuated to the neighboring island of Halmahera. Details of premonitory activity are limited, but relatively deep earthquakes had been recorded 18-19 January. Information Contacts: VSI; ANS; UPI. Since the 12 February ash eruption, dark "smoke" has frequently been reported from the crater. Seismic activity continued beneath the volcano, with about five volcanic and 75 deeper ("tectonic") earthquakes daily during March. On 17, 23, and 24 May seismic tremor was recorded for periods of 3-8 minutes. Deeper earthquakes were recorded at a rate of 13/day during late May. White fume was consistently present above the crater, rising more than 400 m above the summit. A plume has probably been emitted intermittently since the 12 February explosive eruption. Weak white fumes rose 150-300 m above the crater in late July. Collapse and sliding of the crater walls caused extension of the crater toward the NW and E. Fumarole temperatures at the volcano's summit were 82-90°C. On 28 and 29 July, volcanic tremor episodes with amplitudes of 0.5 mm were recorded for 11 and 16 minutes. Volcanic (16), distant tectonic (420), and local tectonic (10) earthquakes were recorded. Press reports indicated that an eruption began at 1847 on 25 April, ejecting a thick reddish column ~ 1.5 km high. Authorities inspected areas believed to be at risk from lava flows, but did not immediately order evacuations. Information Contacts: Jakarta Domestic Service. On 25 April a large explosion at 1848 ejected incandescent tephra from the main crater. The ash column reached 2,500-5,000 m above the volcano and deposited material to the W. The main eruptive activity ceased at 1928, but was followed by smaller eruptions producing ash columns to 1,500 m. A flow, suspected to be a nuée ardente, traveled 4.5 km from the crater, leaving a deposit 5 m thick with a maximum temperature of 320°C. No victims and only minor damage were reported. Activity declined to weak emissions of white to grayish-white vapor 300-500 m above the crater by 30 April. Two strong explosions were seen from Ternate, 6 km ESE of the summit, on 15 June, ejecting mainly white clouds. A 20 June climb revealed only white vapor filling the summit crater. Information Contacts: V. Clavel and P. Vetsch, SVG, Switzerland. Increased volcanic seismicity was recorded in early December, with the number of events rising from 24/day in the first week to 32/day the second week of the month. Typically, no more than five volcanic earthquakes are recorded daily at Gamalama. Surface activity was limited to low-pressure emission of vapor, rising 100-150 m above the crater rim. A thin white vapor plume rose 50-100 m above the crater rim in early March, accompanied by an average of 26 volcanic earthquakes/day. Deep volcanic earthquakes increased from 91 during the first week in March to 159 the following week, as the weekly number of shallow volcanic earthquakes grew from 18 to 26. Dense steam emissions continued through mid-Apr, rising 50-300 m above the crater rim. Earthquakes averaged 12-13/day in mid-Apr, an increase from early April, but only half the early March rate (17:02). Information Contacts: W. Modjo, VSI; UPI. A radio broadcast from Indonesia reported an eruption at Gamalama on 21 May [see 18:7]. An earthquake swarm with 67 events preceded the eruption. 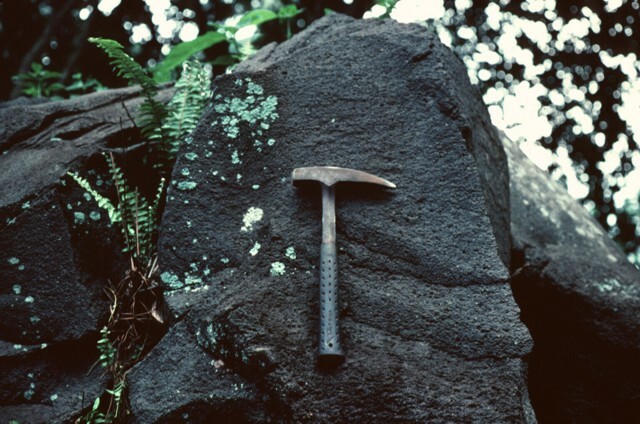 The report described ash and incandescent ejecta as well as nuees ardentes that traveled W along the paths of lava flows from previous eruptions. Information Contacts: Jakarta Radio Network. Ash explosions at 0600 and 0625 on 6 May produced eruption columns that rose 2,500 and 2,000 m, respectively, above the summit. There was also a small eruption at 1500 on 8 May. The strongest explosion occurred at 1338-1352 on 12 May, preceded by detonation sounds and incandescent ballistic bombs. A black ash column from this eruption rose 3,000 m and could be seen from the observatory. About 141,000 m3 of material was erupted. There was no damage caused by this eruption. An Indonesian radio broadcast also reported an eruption on 21 May (18:05). A pilot report described a smoke plume at 1000 on 17 August rising ~ 480 m above the rim before drifting NNW and dissipating. Information Contacts: W. Tjetjep, VSI; J. Lynch, SAB. Following its May 1993 eruption . . . activity remained high. An explosion in January 1994 at the main crater produced a dark ash cloud 750-1,000 m tall. Small gas explosions were common during February 1994, they often rose 200-400 m above the crater. One or more ash eruptions took place 25-27 March, dusting the village of Rua on the volcano's eastern slopes with thin ash. Tectonic earthquakes were numerous, especially following the Halmahera earthquake of 21 January, 1994. Prior to the earthquake there were typically 10-25 events/day, following it there were 40 events/day. Volcanic earthquakes remained at normal levels, 3-5 events/day. Information Contacts: W. Tjetjep, VSI; BOM Darwin, Australia; S. Matthews, Univ of Bristol; UPI; Antara News Agency. A NOTAM that originated from the Ujung Pandang FIR on 6 May 1994 requested that all aircraft avoid the area around Gamalama volcano. VSI did not note any unusual activity on that day, and no ash cloud was detected on satellite imagery. The warning only noted that the height of "dust" was variable. Members of the SVE visited Gamalama at 1130 on 21 July. Summit activity consisted of violent degassing from the summit crater, producing a white-gray plume above the volcano; no solid material was ejected during the observations. A small active fumarolic area on the W crater rim exhibited yellow sulfur deposits. White vapor was rising from a large crack on the E crater rim, a part of the crater that appeared to be very unstable. The bottom of the crater could not be seen from the rim. VSI reported that activity from the main crater increased with a sudden eruption on 5 August 1994 at 2125. The eruption produced an ash cloud to a height of 3,000 m above the summit . . . and accompanying ash falls. A felt earthquake a few minutes before the eruption had an intensity of MM II-III. Volcanic tremor recorded since 10 August preceded another eruption at about 2400 on 13 August from the same location. A news report indicated that explosions on 14 August caused ashfall in Ternate (~ 4 km SE), and that 5-20 minor explosions/day had occurred in recent days. Following eruptions in May 1993 (18:5 & 7; and VSI, 1993a), seismicity steadily decreased to low levels by the end of June; vapor emission stopped by the end of August 1993 (VSI, 1993b). Seismicity began increasing again in December 1993 (VSI, 1993b), and explosions were reported during January-March 1994 (19:05). Information Contacts: W. Tjetjep, VSI; H. Gaudru, C. Pittet, M. Auber, C. Bopp, and O. Saudan, EVS, Switzerland; BOM Darwin, Australia; AP; Radio Republik Indonesia. An eruption late on 15 October sent a plume ~ 300 m above the summit . . ., according to news reports. No casualties or damage were reported, although some ash fell in several villages on the slopes of the volcano and the explosion shook buildings. Information Contacts: Antara News Agency; Reuters. According to the Volcanological Survey of Indonesia (VSI), at 0300 on 31 July 2003, six type-A volcanic earthquakes were recorded. At 0600 the cloud issuing from the crater became thicker, but the gas pressure remained modest and similar to that normally seen. A series of explosive eruptions that began at 1434 sent a dark gray ash column 500-1,000 m high that drifted E toward Sultan Baabulah airport. A second explosion at 1625 produced a dark-gray ash column with strong gas pressure. The ash column rose 1-2 km above rim and drifted E carrying glowing material. At 1627 a pyroclastic flow into Togorar valley on the NE flank traveled as much as 1 km but did not reach the village. A continuous blasting sound accompanied a series of ash emissions. Between 1704-1812, a dark gray ash column rose to 1,000-1,500 m, then during 1850-2200 a white-gray ash plume rose to 500 m. Several white gas plumes rose 10-150 m from 2209 through 0600 on 1 August. A steady glow was observed from 0200-0400. After the initial outbursts, during 0000-1430 on 1 August, seismometers registered seven tectonic earthquakes, 16 shallow volcanic earthquakes, and two deep volcanic earthquakes. Continuous tremor also registered, with a maximum amplitude of 29-30 mm. Ashfall was 1-3 cm thick in the E part of the area, and some of the local population was evacuated. According to local officials, Ternate (the regional capital, ~7 km E of Gamalama) was covered with thick ash. There were no reports of casualties or damage. The hazard status was set at level 3 starting at 1250 on 31 July and raised to the maximum, level 4, at 0000 the next day. VSI reported that the last eruption occurred in 1996 from the main crater, followed by a pyroclastic flow to the E.
An eruptive event on 31 July 2003 at Gamalama produced ashfall and pyroclastic flows (BGVN 28:07). The Volcanological Survey of Indonesia (VSI) report for the week of 28 July-3 August noted that the hazard status was downgraded to Alert Level 3 on 2 August. A white gas plume was reported as rising 10-50 m above the summit and the seismograph record was dominated by emission events. Volcanic activity was low during 18-31 August, with white gas emissions and several small ash explosions. White-gray ash plumes emitted from the crater reached 100 m high. Night glow was seen just above the crater rim. Recorded emission and tectonic earthquakes averaged four events per day. Reduced activity continued during 1-28 September 2003, again with white gas emission and small ash explosions that occurred several times. Seismicity was dominated by tectonic and emission events (table 1). The hazard status since 18 August has been at Alert Level 2 (on a scale of 1-4). Table 1. Seismicity at Gamalama during 1-28 September 2003. Courtesy of VSI. A series of explosive eruptions on 31 July 2003 produced ashfall and pyroclastic flows (BGVN 28:07). Several small ash explosions occurred throughout August and September (BGVN 28:09). Activity was similar during 29 September-5 October 2003, with white gas emissions rising 25-100 m and some small ash explosions. Volcanic seismicity consisted of one deep earthquake, two shallow earthquakes, and 24 emission events. Activity remained low the following week, 6-12 October, with gas emissions rising 25-50 m. The number of daily seismic events this week had returned to normal levels, so the hazard status was downgraded to Alert Level 1 (on a scale of 1-4) on 13 October. On 24 August 2007, the Center of Volcanology and Geological Hazard Mitigation (CVGHM) raised the Alert Level of Gamalama from 1 to 2 (on a scale of 1-4) due to an increase in seismic activity beginning 20 August. Prior to 10 August, diffuse white plumes rose to an altitude of 1.8 km, then increased in altitude to 2 km during 10-23 August. On 23 August, white and gray plumes rose to an altitude of 2.1 km. Concurrent with the increased Alert Level, government officials banned access within a 2-km radius of the active crater. No thermal anomalies were measured by MODIS satellites during this time. CVGHM lowered the Alert Level to 1 on 9 October 2007, based on visual observations of plume altitudes and a decline in seismicity. On 11 May 2008, CVGHM reported that emissions from Gamalama had risen to higher altitudes during the previous two days. On 10 May, white-to-gray plumes rose to an altitude of 1.8 km and drifted N. On 11 May, white plumes increased throughout the day from 1.7 to 2.2 km altitude. Based on the visual observations and seismicity, CVGHM raised the Alert Level and warned residents and tourists not to go within 2 km of the summit. No thermal anomalies were measured by MODIS during this time. 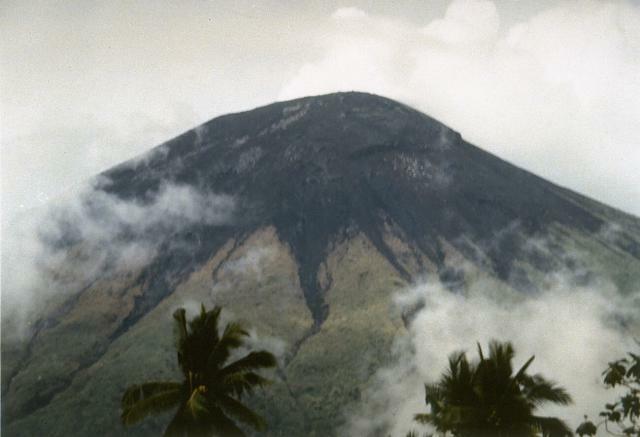 Gamalama volcano, Indonesia, erupted on 4 December 2011, following precursory gas emissions and an increase in seismicity. Lahars killed at least four people, injured dozens, and thousands evacuated. Gamalama had remained at Alert Level 2 (on a scale from 1-4) since 11 May 2008 (BGVN 33:10). Coincident with the beginning of the eruption at 2300 on 4 December, CVGHM raised the Alert Level from 2 to 3, prohibiting access to areas within 2.5 km of the summit. In late January seismicity stabilized and the hazard status fell. Precursory activity. The Center for Volcanology and Geological Hazard Mitigation (CVGHM) reported white plumes reaching 25 and 150 m above the summit of Gamalama on 1 and 4 December, respectively (figure 1). Clouds obscured the view on 2-3 December. Seismicity also increased during 1-4 December, with a sharp increase in the occurrence of shallow volcanic earthquakes, from one on 3 December to 47 on 4 December (table 2). Tremor was recorded continuously after 2258 on 4 December. At 2300, the Alert Level was raised to 3, and access to Hazard Zone II (areas within 2.5 km of the summit) was prohibited. Figure 1. Reported plume heights at Gamalama during 1-14 December 2011. No plumes were reported by the Center for Volcanology and Geological Hazard Mitigation (CVGHM) or the Darwin Volcanic Ash Advisory Centre (VAAC) on 2-3 and 10-12 December. Plumes heights indicated in white were ash-free emissions, while those in black indicate plumes that contained ash. The Alert Level was raised from 2 (yellow) to 3 (orange) at 2300 on 4 December. Data courtesy of CVGHM and Darwin VAAC. Table 2. Precursory seismicity during 1-4 December 2011 at Gamalama. Note the sharp increase of shallow volcanic earthquakes on 4 December 2011; that day, tremor amplitude also increased by at least an order of magnitude. The symbol '--' indicates data not reported. Data courtesy of CVGHM. Eruption. According to the Jakarta Post, most residents living on Gamalama's slopes evacuated, although some insisted on staying in their homes. Most of Ternate and its surrounding villages were covered in ash (figure 2), and ash fall caused the loss of electricity in some areas around the slopes of the volcano. No fatalities were reported. Figure 2. Residents in the Tubo district (3-4 km from the summit) walking on recently deposited (and most likely reworked) volcanic material that fell or was remobilized after an eruption of Gamalama. Photograph dated 5 December 2011; courtesy of Associated Press. Over the next 10 days (into mid-December) the Darwin Volcanic Ash Advisory Centre (VAAC) reported ash plumes that rose to 2.1-6.1 km altitude (figures 1 and 4). Some plumes drifted up to 140 km to the S, SE, and E. Three photos of plumes on 12 December appear in figure 3. Figure 3. Photos of ash-bearing eruptive plumes from Gamalama taken on 12 December 2011. Courtesy of Andi Rosadi, Volcano Discovery. Fatal lahar. The Jakarta Post reported that heavy rainfall mobilized fresh ash deposits, spawning a lahar on 27 December 2011 that killed at least four people and injured dozens; many homes were destroyed in the Tubo and Tofure districts, and in locations along the Togorara and Marikurubu rivers (figure 4). On 1 January 2012, the Jakarta Post reported that up to 3,490 people were still being housed in ten different emergency shelters. It also reported that the National Disaster Mitigation Agency (Badan Nasional Penanggulangan Bencana, BNPB) had allocated 1.1 billion Indonesian Rupiah (US$121,000) in emergency funds for the residents affected by the eruption. The Jakarta Globe reported that thousands of farmers had their crops destroyed by ash erupted during December 2011. Agricultural losses are especially devastating, as the island has historically been a major producer of spices such as cloves. Figure 4. Combined Advanced Spaceborne Thermal Emission and Reflection Radiometer (ASTER) imagery of Gamalama (Ternate Island) on 17 April 2005 and 30 November 2006. Ternate City, the districts of Tubo and Tofure, and the Togorara and Marikurubu rivers are indicated. Index map shows regional location. ASTER imagery courtesy of the Geological Survey of Japan; index map modified from MapsOf.net. Eruption wanes. Following a month of decreasing activity, CVGHM decreased the Alert Level from 3 to 2 on 24 January 2012. The Alert Level notification cited that, since 23 December 2011, seismicity was dominated by tremor with relatively stable amplitude (0.5-2 mm) and hot air blasts that tended to decrease in occurrence (table 3). 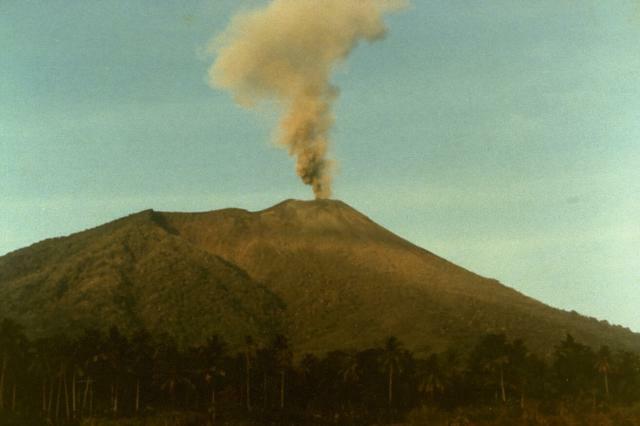 During the same period, observed plumes from Gamalama reached 25-100 m above the summit, none of which contained observable ash. In consequence of the lowered Alert Level, access to the summit craters of Gamalama was prohibited, and residents living along rivers descending the flanks of the volcano were advised to be aware of the dangers of lahars. In addition, the North Maluku Province Local Government was asked to prepare evacuation procedures in the case of an increase in activity. Table 3. Seismicity at Gamalama from 24 December 2011 through 23 January 2012. CVGHM lowered the Alert Level from 3-2 on 24 January. Data courtesy of CVGHM. Information Contacts: Center for Volcanology and Geological Hazard Mitigation (CVGHM), Jl. Diponegoro 57, Bandung, West Java, Indonesia, 40 122 (URL: http://www.vsi.esdm.go.id/); Darwin Volcanic Ash Advisory Centre (VAAC), Bureau of Meteorology, Northern Territory Regional Office, PO Box 40050, Casuarina, NT 0811, Australia (URL: http://www.bom.gov.au/info/vaac/); The Jakarta Post, Jl. Palmerah Barat 142-143, Jakarta 10270, Indonesia (URL: http://www.thejakartapost.com/); Associated Press (AP) (URL: http://www.apimages.com/); Andi Rosadi, Volcano Discovery (URL: http://www.volcanodiscovery.com/); Erik Klemetti/Wired (URL: http://www.wired.com/wiredscience/eruptions); Geological Survey of Japan (URL: http://www.gsj.jp/); MapsOf.net (URL: http://mapsof.net/); The Jarkarta Globe, Citra Graha Building, 11th Floor, Suite 1102, Jl. Jend. Gatot Subroto Kav 35-36, Jakarta 12950, Indonesia (URL: http://www.thejakartaglobe.com/). This report discusses a series of small but punctuated eruptions on 15-17 September 2012 associated with the return of seismicity at Gamalama. Fog obscured visibility but ash fell on inhabited areas. The eruptions were judged similar to those seen 4 December 2011 (BGVN 36:12). As we noted previously, heavy rains after the 4 December 2011 eruptions led to lahars on 27-28 December that killed four people, injured dozens, and displaced thousands (BGVN 36:12). Photos showed that these lahars had carried many meter-diameter blocks into inhabited areas on the lower flanks. Videos from helicopter flights confirmed that in the upslope region, chutes and drainages had also fed finer ash into the lahars. According to the Center for Volcanology and Geological Hazard Mitigation (CVGHM), on 24 January 2012, after witnessing an interval of generally reduced seismicity, an absence of significant ash-bearing plumes, and weak steam plumes rising only ~100 m above the summit, they lowered the Alert Level from 3 to 2 (on a scale from 1-4). 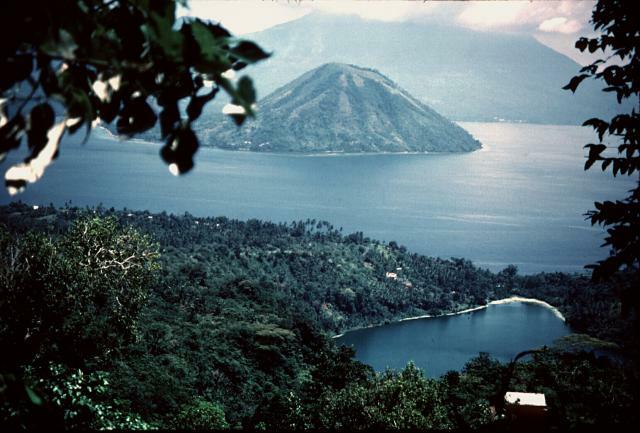 As geographic background, Gamalama volcano emerges from the sea to form the near-conical 76 km2 Ternate island. The island is situated in the Molucca (Maluku) islands in NE Indonesia about midway between the islands of Borneo and New Guinea (figure 5). Figure 5. (A) An index map of Indonesia, including the Molucca islands and regional landmarks. Courtesy of U.S. Department of State. (B) A map of the Molucca (Maluku) islands, highlighting Gamalama (Ternate). Courtesy of Indonesia Explore. Seismicity and eruptions of September 2012. Significant seismicity and other activity at Gamalama remained low from early 2012 until September. During 1-14 September white plumes were sometimes observed rising ~10 m above the crater. When visibility allowed, these plumes were observed from the local obseratory post at Marikuruba and from the W coast of the island, but fog and clouds generally obscured the view. The telemetered seismograph system (PS-2) recorded deep volcanic earthquakes, shallow volcanic earthquakes, and local tectonic earthquakes, each occurring fewer than five times during 1-14 September. During that same period, there were 63 long-distance tectonic earthquakes and 42 hot air blasts recorded; once they began, signals interpreted as the hot air blasts amounted to 8 occurrences per day. Visual observations and tremor during this time period appeared similar to this volcano's past behavior. On 15 September 2012 the following seismic events were recorded: 6 long distance tectonic earthquakes, 9 deep volcanic earthquakes, 2 shallow volcanic earthquakes, 14 hot air blasts accompanied by rumbling sounds, and an interval of tremor began with amplitudes reaching 3-4 mm. Six minutes after the tremor, eruption signals occurred with a maximum amplitude of 40 mm. A phreatic explosion produced ash fall and debris fall. Fog obscured the visibility. On 16 September 2012, CVGHM reported low-amplitude tremor continuing during 0000-1200 (with 1.5-2.5 mm amplitudes). Medium-to-heavy rain fell at the summit around 1200. At 1358 tremor amplitudes increased to 28 mm, followed 17 min later by a "severe eruption." That eruption drove an ash-laden plume to ~1 km above the crater. The plume drifted S and SE (figure 6A), and 5 min later ash fell at the observation post. The Alert Level was raised to 3 and visitors and residents were warned not to come within 2.5 km of the crater. CVGHM suggested that the eruption vented at the same location as those of December 2011. Figure 6. (A) Photo of the Gamalama eruption on 16 September 2012 viewed from the NW. The ash plume is immediately blown to the S and SE with almost no vertical development. (B) The 17 September 2012 eruption of Gamalama viewed from the ESE. Both photos courtesy of Associated Press and The Jakarta Globe. An eruption on 17 September 2012 produced a white-and-gray plume that rose 300 m above the crater and drifted E and SE (figure 6B). Ashfall was reported in the S, SE, and E parts of the island. Calm prevailed for at least a few weeks after the eruption. Seismicity decreased in early October; on 8 October white plumes rose a mere 10-50 m. The Alert Level was lowered to 2 on 9 October, and the resulting exclusionary zone extended 1.5 km from the crater. Information Contacts: Center for Volcanology and Geological Hazard Mitigation (CVGHM), Jl. Diponegoro 57, Bandung, West Java, Indonesia, 40 122 (URL: http://www.vsi.esdm.go.id/); Darwin Volcanic Ash Advisory Centre (VAAC), Bureau of Meteorology, Northern Territory Regional Office, PO Box 40050, Casuarina, NT 0811, Australia (URL: http://www.bom.gov.au/info/vaac/); The Jakarta Post, Jl. Palmerah Barat 142-143, Jakarta 10270, Indonesia (URL: http://www.thejakartapost.com/); Associated Press (AP) (URL: http://www.apimages.com/); USA Today, 7950 Jones Branch Road, McLean, VA 22102 (URL: http://www.usatoday.com/); BBC News (URL: http://www.bbc.co.uk/); United States Department of State - Bureau of Consular Affairs (URL: http://travel.state.gov/); Indonesia Explore (URL: http://indonesiaexplore.com/). Gamalama has been intermittently active for many decades, with fluctuating seismicity and occasional weak explosions resulting in ash plumes. Pyroclastic flows occurred in 1993, 1996, and 2003, while a deadly lahar occurred in 2011 (BGVN 18:05, 28:07, 36:12). More recently, a series of small explosions caused ashfall during 15-17 September 2012 (BGVN 37:11). The volcano was quiet until December 2014, when an eruption injured some hikers, with one missing. Ash explosions during 16-20 July 2015 caused about 1,500 people to evacuate. Additional explosions took place on 4 August and 8 September, but activity declined through October 2015. Following the September 2012 activity, PVMBG lowered the Alert Level on 9 October from 3 to 2 (on a scale of 1-4, where 2 denotes Caution), based on visual and instrument monitoring of volcanic activity. The Alert Level remained at 2 through at least the end of October 2015. Visitors and residents were warned not to approach the crater within a radius of 1.5 km. According to a news article (Associated Press), an explosion on 18 December 2014 generated an ash plume that rose 2 km. Another news account (Agence France-Presse, as reported by the Australian Broadcasting Corporation) quoted Mansur Mahli, a local disaster management agency official, who stated that 11 hikers were injured while running down the slope during the eruption, and three of them were hospitalized for broken bones. Slow-moving lava at the summit was visible, and ashfall occurred in local villages. The Sultan Babullah airport, 6 km NE, was closed along with schools and businesses. According to the Darwin Volcanic Ash Advisory Centre (VAAC), ash plumes rose to an altitude of 2.1 km on 24-25 December and drifted almost 30 km SW. There were no further reports of activity until The Pusat Vulkanologi dan Mitigasi Bencana Geologi (PVMBG, Centre of Volcanology and Geological Hazard Mitigation) noted diffuse white plumes during March through 22 April 2015 that rose as high as 50 m above the summit; on 7 April the plumes became dense and rose 100 m. Seismicity fluctuated but remained generally low. An explosion on 16 July 2015 generated, according to the Badan Nasional Penanggulangan Bencana (BNPB, National Disaster Management Authority), a gray-and-white plume that rose as high as 1.5 km above the crater and drifted N. The Sultan Babullah International airport was closed on 18 July. Several explosions during 18-19 July produced white-and-gray plumes that rose 300-800 m and drifted NW. The Darwin VAAC reported that during 16-20 July ash plumes rose to altitudes of 2.1-5.5 km and drifted 20-130 km NE, NW, W, and SW. A preliminary count of refugees showed there were 1,505 people (450 families) displaced by the eruption. Ash deposits were 1.5-6 mm thick in northwestern villages. On 4 August 2015, BNPB reported that Gamalama continued to erupt, although with low intensity; ash fell in nearby communities and tremor was continuous. According to the Darwin VAAC, the ash plume drifted over 20 km NW. BNPB reported that, as of 4 August 2015, the total number of evacuees in shelters was 1,791. PVMBG reported that a sudden, small explosion from a fissure on the NW flank occurred on 8 September with no precursory seismicity, and produced a plume that rose 1 km above the fissure. The plume was also noted by the Darwin VAAC, which concluded that it rose to an altitude of 3 km and drifted more than 25 km NE. Gray plumes rose from 300-600 m above the vent during 9-24 September. During 1 October-3 November 2015, white plumes rose as high as 300 m above the main crater and fissures on the E and NW flanks. PVMBG reported that during 1 August-4 November, seismicity fluctuated and was dominated by hybrid earthquakes and signals indicating emissions. Increased seismicity was recorded during 3-5 August, 11-19 August, and 8-22 October 2015, though seismicity declined overall. Information Contacts: Pusat Vulkanologi dan Mitigasi Bencana Geologi (PVMBG, also known as CVGHM, Center for Volcanology and Geological Hazard Mitigation), Jl. Diponegoro 57, Bandung, West Java, Indonesia, 40 122 (URL: http://www.vsi.esdm.go.id/); Darwin Volcanic Ash Advisory Centre (VAAC), Bureau of Meteorology, Northern Territory Regional Office, PO Box 40050, Casuarina, NT 0811, Australia (URL: http://www.bom.gov.au/info/vaac/); Badan Nacional Penanggulangan Bencana (BNPB) (URL: http://www. bnpb.go.id); Associated Press (URL: http://www.ap.org/); Agence France-Presse (AFP) (URL: http://www.afp.com/en). Intermittent weak explosions at Gamalama resulting in ash plumes have occurred for many decades, most recently in September 2012, December 2014, and July-September 2015 (BGVN 40:12). This report covers activity between 1 December 2015 and February 2017. Data were primarily drawn from reports issued by the Pusat Vulkanologi dan Mitigasi Bencana Geologi (PVMBG, also known as Center for Volcanology and Geological Hazard Mitigation) and the Darwin Volcanic Ash Advisory Centre (VAAC). During 1 January-6 March 2016, PVMBG noted that seismicity fluctuated but decreased overall; shallow volcanic earthquakes and signals indicating emissions appeared on 3 March and a series of deep volcanic earthquakes were detected on 6 March. The Alert Level remained at 2 (on a scale of 1-4), and visitors and residents were warned not to approach the crater within a 1.5-km radius. PVMBG reported that, at 0628 on 3 August 2016, a weak explosion generated an ash plume that rose 500-600 m above the crater and drifted SE and S. Ash emissions decreased at 0655. Consistent with this, the Darwin VAAC, based on analyses of satellite imagery and wind model data, and information from PVMBG, reported that ash plumes reached a maximum altitude of 2.7 km (summit elevation is 1.7 km) and drifted S, SE, E, and NE. Ashfall was reported in areas on the SSE flank, including the Ake Huda area. A news account (Jakarta Globe) stated that the Babullah Airport in Ternate, North Maluku, was closed for a day while volcanic ash was cleared from the runway (about 6 km ENE of the volcano). On 5 August PVMBG noted that seismicity continued to be elevated, although inclement weather prevented visual observations. Information Contacts: Pusat Vulkanologi dan Mitigasi Bencana Geologi (PVMBG, also known as Center of Volcanology and Geological Hazard Mitigation (CVGHM), Jalan Diponegoro 57, Bandung 40122, Indonesia (URL: http://www.vsi.esdm.go.id/); Darwin Volcanic Ash Advisory Centre (VAAC), Bureau of Meteorology, Northern Territory Regional Office, PO Box 40050, Casuarina, NT 0811, Australia (URL: http://www.bom.gov.au/info/vaac/); Jakarta Globe (URL: http://jakartaglobe.id/). Gamalama is a near-conical stratovolcano that comprises the entire island of Ternate off the western coast of Halmahera, and is one of Indonesia's most active volcanoes. The island was a major regional center in the Portuguese and Dutch spice trade for several centuries, which contributed to the thorough documentation of Gamalama's historical activity. Three cones, progressively younger to the north, form the summit. Several maars and vents define a rift zone, parallel to the Halmahera island arc, that cuts the volcano. Eruptions, recorded frequently since the 16th century, typically originated from the summit craters, although flank eruptions have occurred in 1763, 1770, 1775, and 1962-63. Bronto S, Hadisantono R D, Lockwood J P, 1982. Geologic map of Gamalama volcano, Ternate, North Maluku. Volc Surv Indonesia, 1:25,000 geol map. Gogarten E, 1918. Die Vulkane der Nordlichen Molukken. Zeit Vulk, 2: 1-298. There is data available for 87 Holocene eruptive periods. There is no Deformation History data available for Gamalama. A small explosive eruption of Gamalama volcano in September 1980 is seen from the airport on the NE side of Ternate Island. Nearly 40,000 people evacuated to a nearby island during the first two days of the eruption, which began on 4 September and lasted until the 23rd. Photo by S.R. 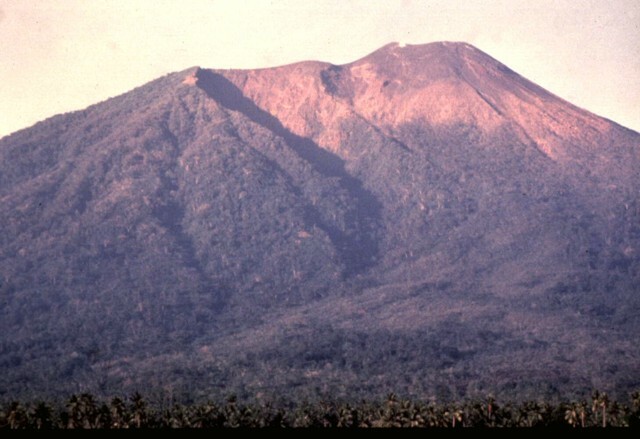 Wittiri, 1980 (Volcanological Survey of Indonesia). 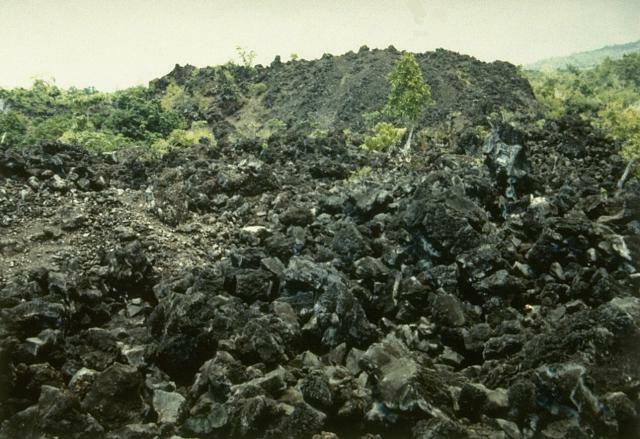 The blocky Batu Angus lava flow traveled from the summit down the northern flank to the sea during an eruption from March 10-13, 1737. 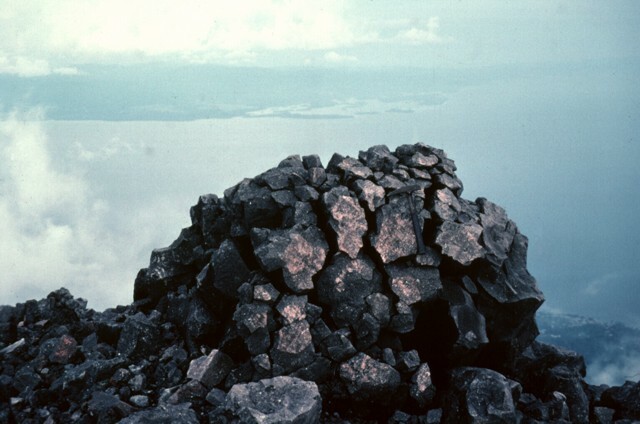 The lava flow forms the irregular northern tip of Ternate Island. Photo by Ruska Hadian, 1994 (Volcanological Survey of Indonesia). Tolire Jaha maar on the lower NW flank formed during a violent eruption in 1775. The eruption began with explosive activity at the summit on August 20. On the night of September 5-6, a devastating base surge accompanying formation of the maar was responsible for most of the 141 people that were killed during the eruption. The steep-walled maar is 700 m wide. A smaller maar, Tolire Kecil, formed to the NW along the coast during the same eruption. Gamalama volcano (also known as the Peak of Ternate), one of the most active volcanoes of Indonesia, forms Ternate Island off the western coast of Halmahera. The northern and youngest of three cones forming the summit of Gamalama is seen here from the NE. Unvegetated areas in this 1994 photo consist of the ejecta blanket from recent explosive eruptions. Frequent eruptions have occurred since the 16th century, most of which originated from the summit vent. Photo by Gatot Sugiharto, 1994 (Volcanological Survey of Indonesia). Gamalama (Peak of Ternate) is a near-conical stratovolcano that rises abruptly NW of the city of Ternate, the principal port of the renowned spice islands of northern Maluku. Three cones, progressively younger to the north, form the summit of Gamalama. Several maars and vents define a rift zone, parallel to the Halmahera island arc, that cuts the volcano. Eruptions from Gamalama, one of the most active volcanoes in Indonesia, have been recorded since the 16th century. Photo by Jack Lockwood, 1980 (U.S. Geological Survey). The three craters forming the summit of Gamalama volcano are visible in this view from the NE flank. The craters have migrated to the north, with the modern cone (right) forming the present summit of the volcano. The prominent shadow cutting diagonally to the right marks the rim of the older GI crater, inside of which the GII cone and crater grew. The GIII crater truncates the flat-topped summit of Gamalama. This classic breadcrust bomb was one of many large volcanic bombs ejected during the September 1980 eruption of Gamalama volcano. Ejected bombs and blocks covered a broad area up to about 1 km from the summit vent, primarily in northern and western directions. The largest ejected block was about 6 m in diameter. The western coast of Halmahera Island is visible in the distance. The flat, grooved surface of this lava block was sandblasted by high-velocity pyroclastic surges during an eruption in 1775. The pyroclastic surges accompanied formation of the 700-m-wide Tolire Jaha maar on the NW flank of Gamalama. 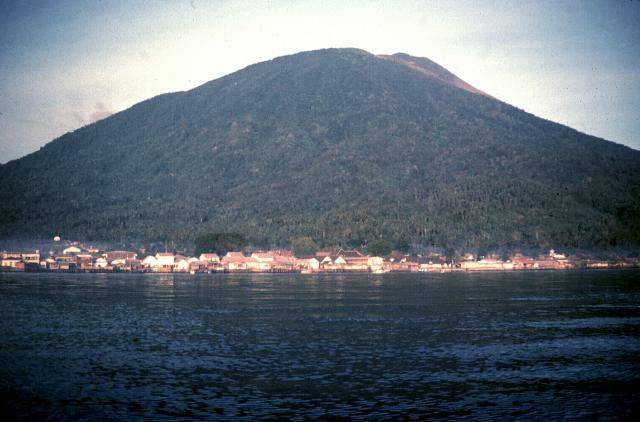 The Tidore volcanic complex rises to the south across a narrow strait from Ternate Island in the foreground. The small conical island is Maitara; in the background, its summit hidden in the clouds over southern Tidore Island, is symmetrical Kiematabu peak, the highest mountain in the northern Maluku Islands. Sabale volcano, a truncated caldera at the NE end of Tidore Island, is obscured behind the leaves at the upper left. 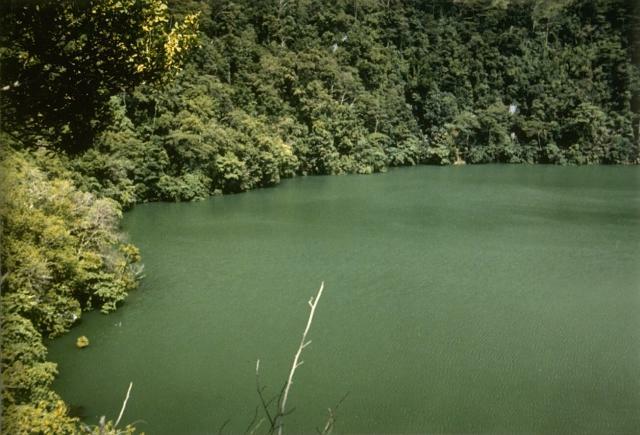 The lake-filled crater in the foreground is Laguna maar on the southern flank of Gamalama volcano. 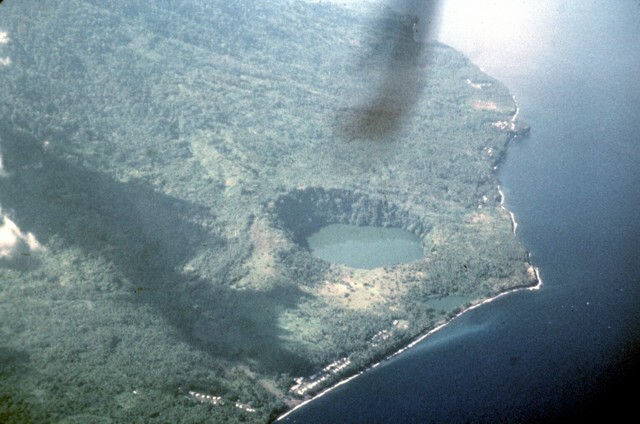 An aerial view from the north shows the steep-walled Tolire Jaha maar and the smaller Tolire Kecil maar, the small lake immediately adjacent to the shoreline. The two maars were formed during a violent eruption in 1775. The eruption began with explosive activity at the summit on August 20. On the night of September 5-6 a devastating base surge accompanying formation of the 700-m-wide maar was responsible for most of the 141 people that were killed during the eruption. The eruption ended with renewed NW-flank explosions November 5-6. The following 13 samples associated with this volcano can be found in the Smithsonian's NMNH Department of Mineral Sciences collections, and may be availble for research (contact the Rock and Ore Collections Manager). Catalog number links will open a window with more information. Large Eruptions of Gamalama Information about large Quaternary eruptions (VEI >= 4) is cataloged in the Large Magnitude Explosive Volcanic Eruptions (LaMEVE) database of the Volcano Global Risk Identification and Analysis Project (VOGRIPA).